The new Bond movie has found its way to local cinemas. One of the highlights is the legendary DB5 making its way through the Scottish highlands. 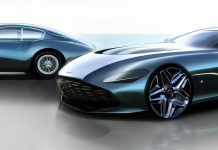 Almost a hundred years after the first Aston Martin and fifty years after the first Bond movie, the European Aston Martin tour visited the local Swiss dealership in Zurich. A selected group of customers were granted VIP test drives, and our team member David from David Kaiser Photography was one of them lucky ones to get a time slot for a short drive ahead of our full road test early next year. A Selene Bronze AM310 Vanquish was awaiting arrival on the parking lot, grouped together next to a Lightning Silver DBS, a Viridian Green Cygnet and a Mariana Blue Vantage. A perfect autumn day in Switzerland provided the backdrop for our test drive with the bright sun shining on the wonderfully shaped body work of the new Vanquish. While fascinated by the new lines and design details, you get the feeling that the body of the Vanquish looks longer than its predecessor, the sportive DBS. Amazingly enough, both have exactly the same length of 4.7 meter. 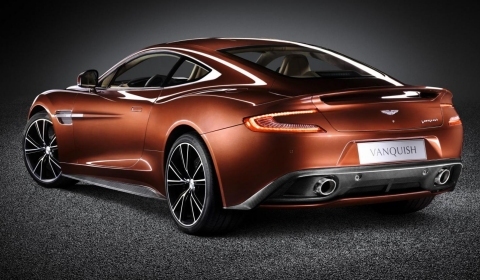 The only difference is the Vanquish’s height of 1294mm exceeding the DBS by 14 mm. 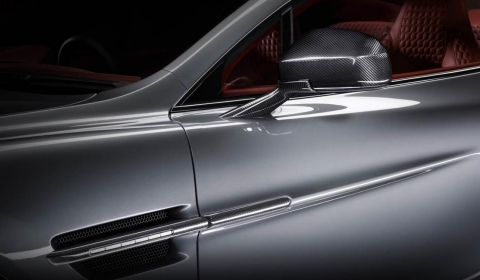 The elegance continues with styling cues such as the new waist line, elongated side strakes and LED rear light blades derived from the One-77 supercar. Another new design characteristic is the Aero Duct on the rear boot lid. The Vanquish is fitted with elegant ten-spoke alloy wheels, designed as a modern interpretation of the classic V12 Vanquish wheel. The new two-door coupe is available in a 2+0 or optional 2+2 seating configuration. The new generation has bonded aluminum and carbon fiber VH structure. The body is made of aluminum, magnesium, alloy and carbon fiber composite. The torsional rigidity is improved by more than 25 percent. The front chassis structure is a full 13 percent lighter than the DBS. The all-alloy front-mid mounted 5,935cc V12 engine has independent quad variable camshaft timing. The engine produces 573hp at 6,750rpm and a maximum torque of 620Nm at 5,500rpm. The zero to 100km/h sprint is completed in 4.1 seconds and the top speed is 295km/h, which is slightly less than the DBS. The twelve-cylinder powerplant is linked to a six-speed touchtronic automatic/sequential manual gearbox and the power is converted to the rear wheels via a limited-slip differential. The wonderful exhaust note is produced by a stainless steel exhaust system with active bypass valves. 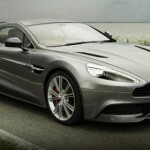 The first meters in the Vanquish are accompanied by the Aston Martin test driver while being surrounded by city traffic. At an empty car park places were swapped and it was time to experience the new member to the Aston family. After challenging city traffic, we took less crowded roads up the hill, taking on sharp corners and empty roads. The throttle reaction is swift and there is enough torque in lower revs to accelerate from the turns. Downshifts are not the favorite behavior of the engine, but it is reasonable enough for a grand tourer. The feedback from the car to the driver is quite good. The carbon ceramic brakes are powerful enough to handle the kinetic energy produced by the 573hp V12 engine and the rather heavy weight of the vehicle. The whole experience is accompanied by a wonderful V12 exhaust note from the rear and the sophisticating ride quality known to Aston’s. Unfortunately, the next test drive was waiting, so it was time to head back to the dealership having a last look at the interior set up and the improved touch multimedia system. No doubt, the golden-ish Vanquish makes pedestrians turning their heads and the elegant and smooth appearance on the motorway gets many thumbs-up from other drivers. The interior of the new Vanquish does not need many words. It is still a benchmark of design, coolness and quality. 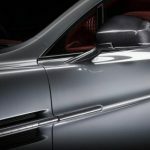 The dials on the dashboard are clear and functional, the curvaceous center console provides the main controls, which are now touch sensitive and the new infotainment system also used in the One-77. The black or color-coded One-77 leather steering wheel with Black Alcantara inserts is another highlight of the cabin. Designed and hand-built at Aston Martin’s global headquarters at Gaydon in Warwickshire the new Vanquish, available as a 2+2 or 2+0, is a true Grand Tourer in all its essence. 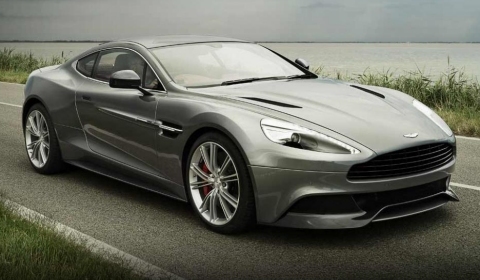 Loaded with luxury, style, grandeur and driving fun, this new Vanquish offers customers a facelift with respect to the DBS. It is an exquisitely beautiful car, inside and out. The overall experience was too short to provide me, you and us with a complete verdict on the car. 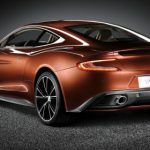 The Vanquish is on GTspirit’s list of road tests and Aston Martin will offer us a vehicle for road testing purposes when the local weather improves. So please stay tuned for a full story on the new Aston Martin AM 310 Vanquish, before that a winter driving session in St.Moritz will offer another change to experience the Vanquish on slippery surfaces and during snowy and icey conditions. Do not forget to check out David Kaiser’s pictures on his personal page! Special thanks to Aston Martin Zurich for this opportunity!